The motto and warcry of the Ó Sionnaigh clan in Ireland for centuries and the name of this new blog and website dedicated to the Ó Sionnaigh (or in English, ‘Fox’) clan of Ireland – and now around the world. 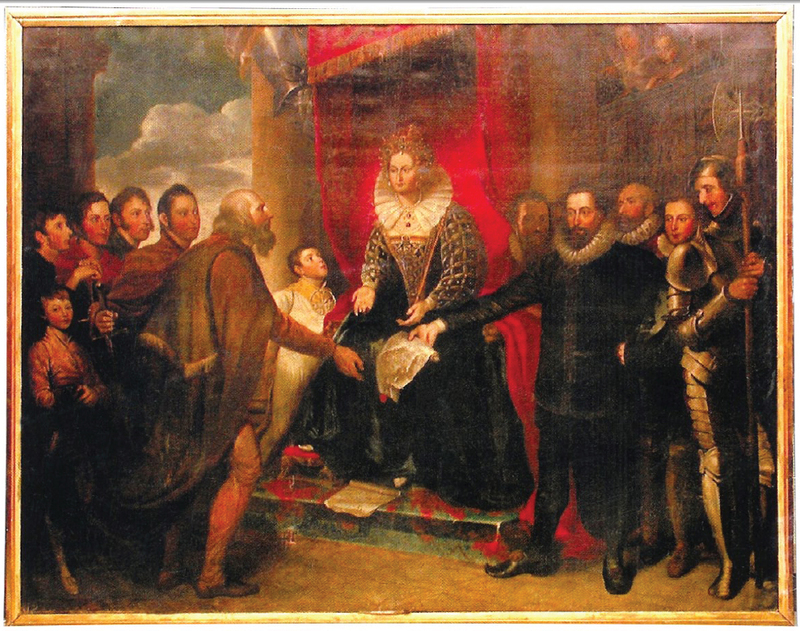 This painting above shows An Sionnach, Hoibeard Ó Sionnaigh (The Fox, Hubert Fox, as called by the English), Lord of the Muintir Thadhgháin (anglicised as Munterhagan, Co. Offaly) being forced to give “fealty” to the English occupiers of his country and Queen Elizabeth I of England, in an effort to save his people, family and lands, in 1599 AD. His kingdom of Muintir Thadhgháin was turned by the English into the Barony of Kilcoursey, named after the Ó Sionnaigh chief residence at Cill Chuairsí (Kilcoursey, Co. Offaly), just east of Clóirtheach (Clara, Co. Offaly). His family became the Barons of Kilcoursey, and himself Sir Hubert Fox. However within fifty years the Ó Sionnaigh family again went to war with the English, a struggle which dated back centuries, as the chief opponents of the Norman-English and English invaders and settlers in the midlands of Ireland. Could I ask what the source for this painting was, or if you have any idea the original work’s current whereabouts? Do you have any further details on its authorship, provenance etc? Many thanks. The image is from the website of an auction house or art gallery in the United States, dating from several years ago. The only references I can find to it now are “Oil painting restoration San Francisco. Art Studio Sergey Konstantinov. Art restoration San Francisco bay area. Go for it! 😉 All family info is free to distribute once linked back to the blog. I am from America. I was raised without a knowledge of my heritage. From the bottom of my heart I thank you for revealing the past to me. I hadn’t realized the thirst till I began to drink. I will be quenched and my children will know the greatness of their roots. Sionnach Abu ! I would like to know the family colors, if that’s possible.